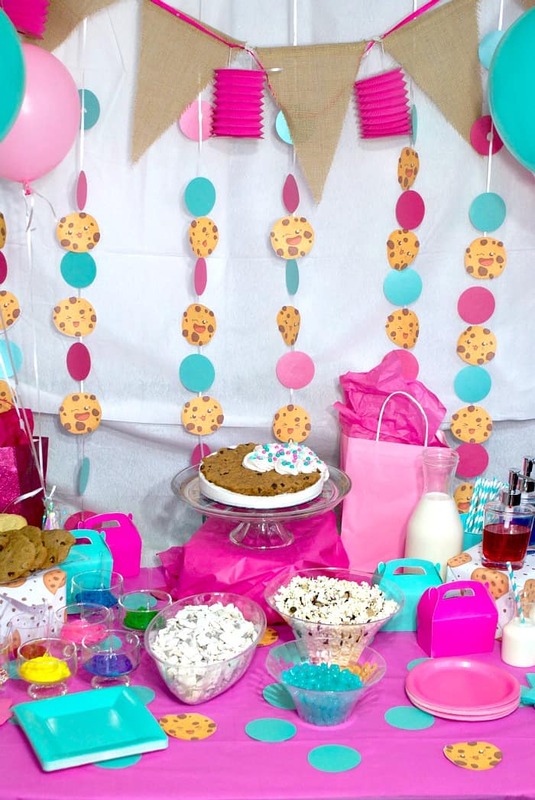 Well, I’ve been building-up to this all week and I have to tell you, this is the most awesome, CUTEST party I think I’ve ever had the pleasure of throwing. I mean, my party-throwing skills are growing by leaps and bounds since my daughter’s sadly wimpy first and second birthday parties. 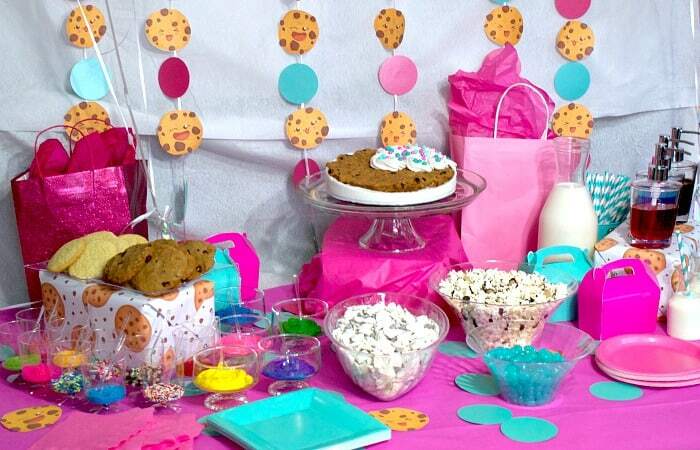 But this Kawaii Cookie Party simply takes the cake. Oh, I did not just say that…I’m so bad. Heh. 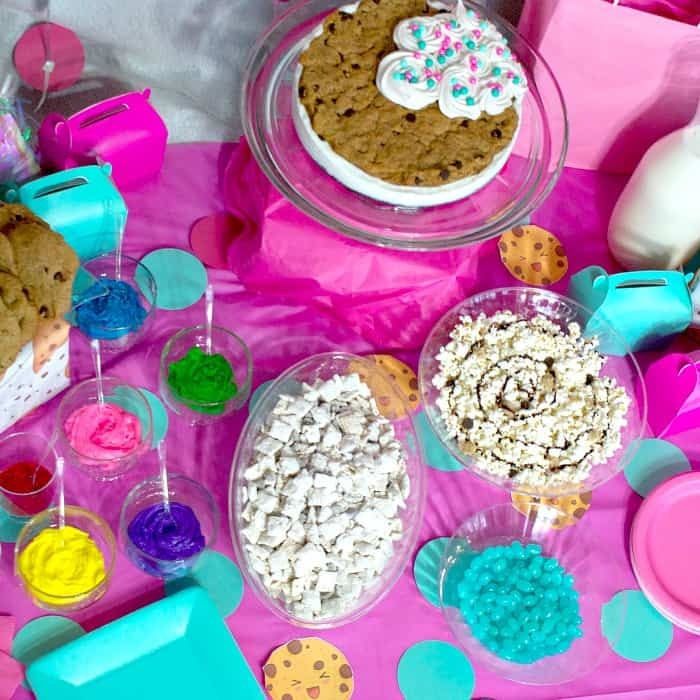 This Kawaii Cookie Party is perfect for any toddler, tween, teen or even an adult–for a boy, just tweak the colors to be like blue and green. 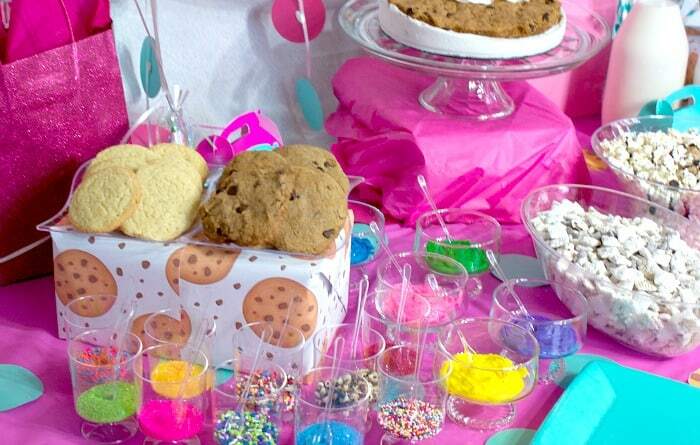 Ok, so boys may not be into it as much–but they’ll LOVE the cookies! LOL! And, by the way, if you’re just here for the Coconut Flavoring Syrup, just keep scrolling. It’s all the way at the bottom after all the pictures of this ridiculously awesome Kawaii Cookie Party. Heh. I just cut out some circles from a couple of pieces of teal and pink scrapbook paper at 3-inches in diameter to make the dots on the background. Using sticky-tack, I affixed them to some balloon ribbon so they’d stay. The rest of the decorations were pretty simple, too. 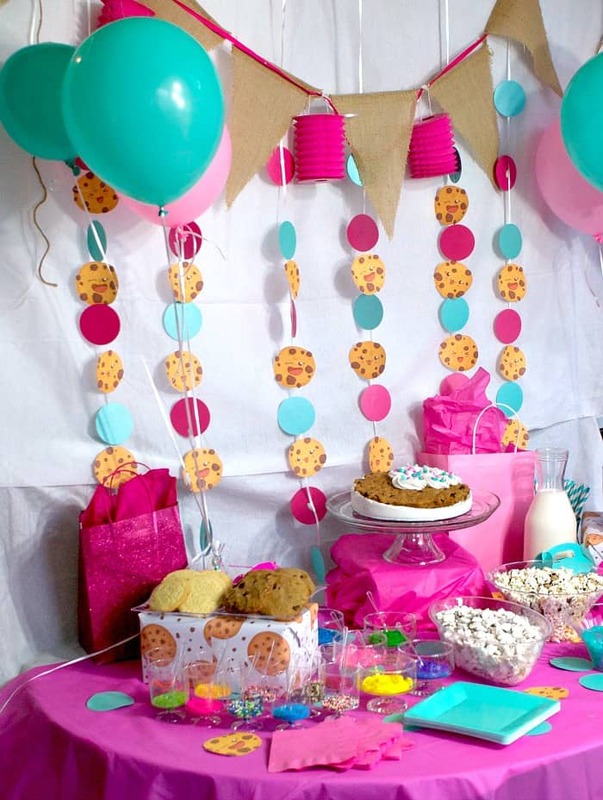 I made some free printable wrapping paper for the boxes under the food, some Kawaii Cookie faces (free printables, too) and then just tossed some other teal and pink things together, like a banner and some balloons, little pink lanterns and a bowl of teal jelly beans. 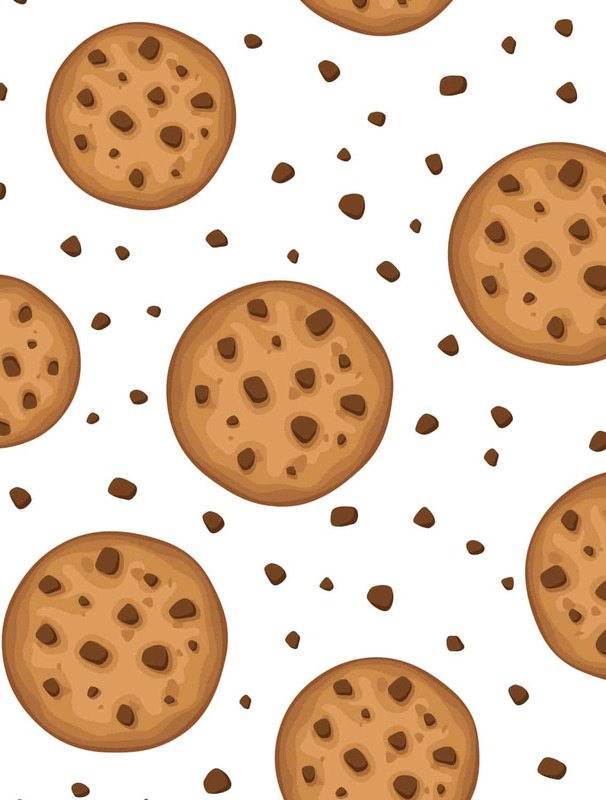 Cookie Wrapping Paper for the boxes under the food. Get it as PDF and JPG. 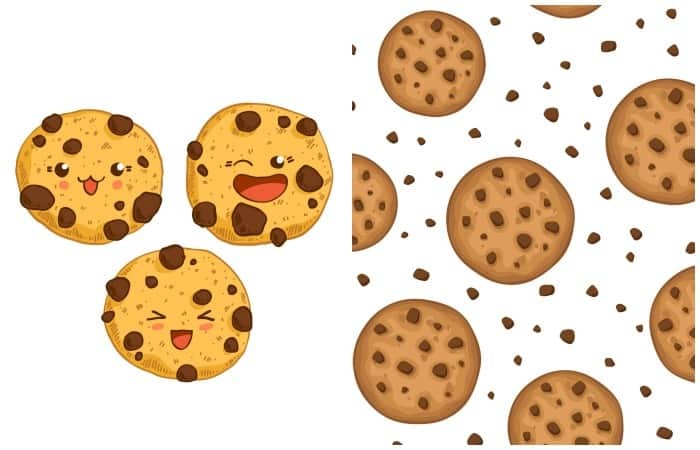 Kawaii Cookie Faces for the dots on the backdrop and on the table. Here’s your PDF and JPG. The star of the show for this party is definitely the food. 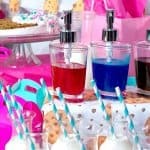 We did a decorate-your-own cookie bar with a ton of different color icings (using the recipe for icing in the Chocolate Chip Cookie Ice Cream Cake recipe), and lots of fun sprinkles in every shade of the rainbow. We did some regular Chocolate Chip Cookies (gluten-free and vegan) as well as Sugar Cookies (recipe coming soon for that). 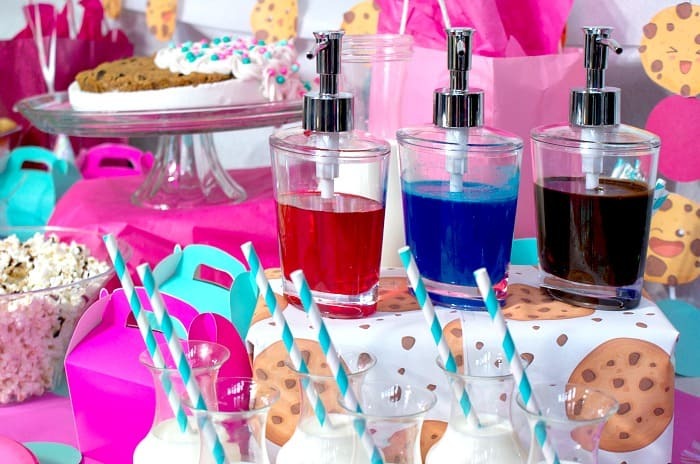 For drinks, we provided milk (coconut milk for those of us with the dairy-allergy) in cute little milk jugs and a flavoring station with chocolate, strawberry, and, my new favorite flavoring: Coconut. The recipe for that beauty is below. And I just popped those flavoring syrups into soap dispensers I got that the dollar store. So cute! I didn’t make the sugar cookies–those were brought by a guest. But, I’m sure I’ll be coming out with a recipe for something similar soon, so you can keep coming back to check…LOL! Easy coconut flavoring syrup for someone trying to flavor milk like coconut. I don't know how else to describe it. Heh. Throw all the ingredients together in a cup with a lid. Be sure the lid is sealed tightly. Shake it like your mamma asked for a gin-and-tonic. Serve to your ridiculously excited kiddos. So, what do you think? 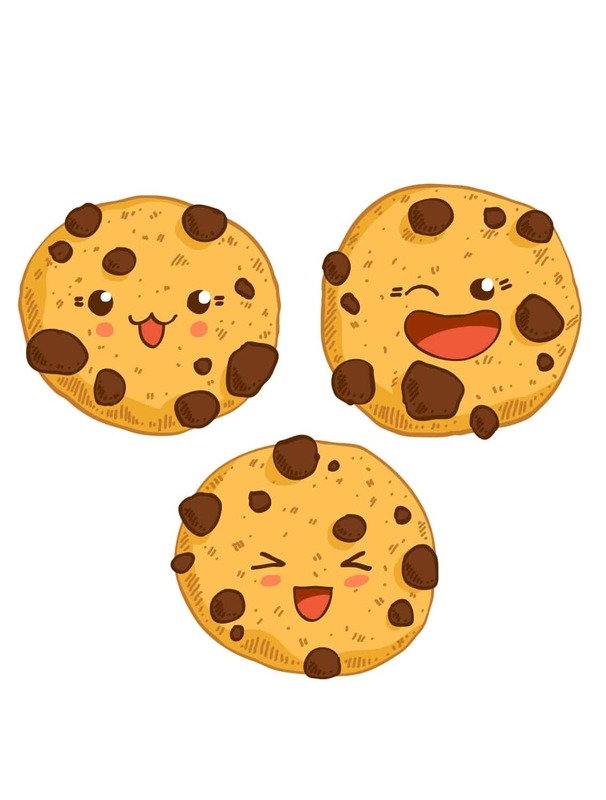 Will you be using this as a template for your own Kawaii Cookie Party? 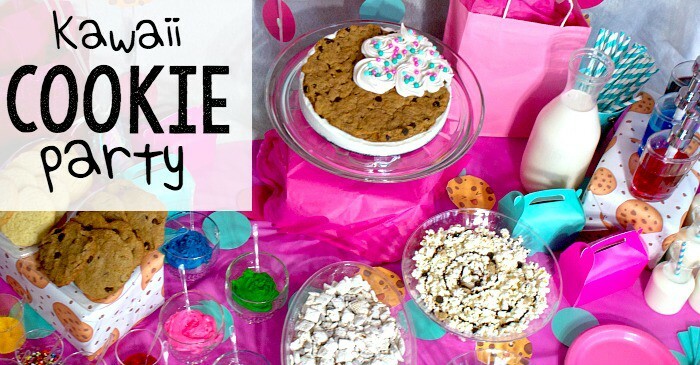 I’d love to see pictures on Pinterest…or hit me up on Facebook with pics of your party! I can’t wait!